Arthur Bickett: But gentlemen, I know nothing about this article being printed. I was out of town. Secret Police Major Kajioka: Then let me read what is printed here in your paper. "If Japan wants to control China we must first crush the United States just as in the past we have to fight in the Russo-Japanese war." 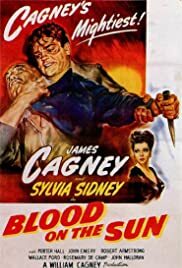 Jimmy Cagney is like a firecracker in this movie, set in pre-WWII Japan. In some ways it's a cross between Casablanca and The Maltese Falcon and sometimes it's silly (e.g., white actors in Japanese makeup), but it's one of the most entertaining movies of its era. It reminds you how much of a talent James Cagney was - he carries the picture. There are also excellent character performances by Wallace Ford and Porter Hall. Even Sylvia Sidney as an unconvincing half-Chinese vixen has some good moments. Beware of the DVD, however - the audio is mixed so badly that at times you'll have to put your ear up against the TV to hear the dialogue.